President Martin Van Buren: Short biography of President Martin Van Buren and the key events during his presidency. Martin Van Buren (1782-1862), nicknamed the "Red Fox of Kinderhook", was the 8th American President and served in office from 1837-1841. The Presidency of Martin Van Buren spanned the period in United States history that encompasses the events of the Jacksonian era. President Martin Van Buren represented the Democratic political party which influenced the domestic and foreign policies of his presidency. Martin Van Buren carried on with the policies begun by his predecessor, President Andrew Jackson. The major accomplishments and the famous, main events that occurred during the time that Martin Van Buren was president included the Panic of 1837, the Neutrality Law of 1838, the tragic events of the Trail of Tears (1838) and the Amistad incident (1839). Communications leapt forward in this period with the invention of the telegraph by Samuel Morse. Martin Van Buren died of asthmatic suffocation on July 24, 1862, aged 79. The next president was William Harrison. The nickname of President Martin Van Buren provides an insight into how the man was viewed by the American public during his presidency. The meaning of the Martin Van Buren nickname "Red Fox of Kinderhook" refers to his Dutch heritage his reputation as a wily, cunning politician. Kinderhook referred to his hometown in New York and "Red Fox" is in reference to his his red-colored whiskers. The character traits of President Martin Van Buren can be described as outgoing, charming, bright, optimistic, courteous and as cunning as a fox. It has been speculated that the Myers-Briggs personality type for Martin Van Buren is an INFJ (introversion, intuition, feeling, judging). A congenial but quiet leader with a intuitive, complex and confident character and a strong goal to better the lives of others. 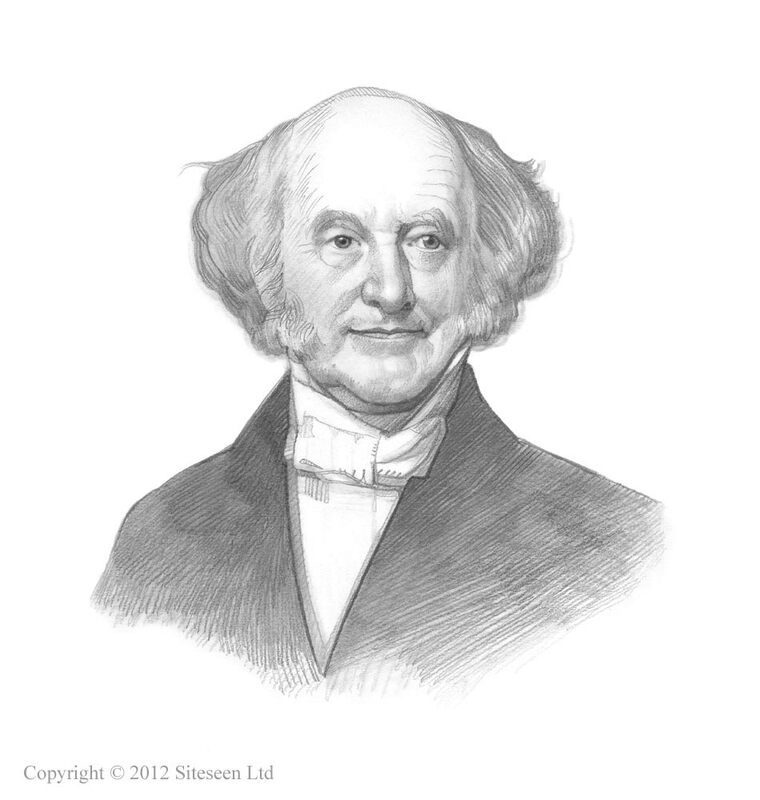 Martin Van Buren Personality type: conscientious, perceptive, creative and a perfectionist. The accomplishments of Martin Van Buren and the most famous events during his presidency are provided in an interesting, short summary format detailed below. Summary of the Panic of 1837: The Panic of 1837 occured during the presidency of Martin Van Buren but were largely due to changes in the banking system initiated by President Jackson and his Specie Circular that effectively dried up credit. President Martin Van Buren was blamed for the Panic of 1837 and his proposals for amending the banking system met with strong opposition by the Whigs, led by Henry Clay, who had previously introduced the economic plan called the 'American System'. Summary of the Aroostook War: The Aroostook War was a bloodless border conflict between Maine and the province of New Brunswick, from February to May, 1839, who both claimed rich timber land in the highlands area known as Aroostook. The Maine-New Brunswick boundary was later settled by the Webster-Ashburton Treaty of 1842 during the presidency of John Tyler. Summary of the Trail of Tears: The infamous event known as the Trail of Tears began during the presidency of Martin Van Buren. Trail of Tears involved the 1000 mile march during the forced relocation of the Five Civilized Tribes consisting of the Cherokee, Creek, Choctaw, Seminole and Chickasaw people. The tribes were forced to travel, from their homelands in the Southeastern United States to reservations in present day Oklahoma, as a result of the Indian Removal Act of 1830 that had been enacted during the presidency of Andrew Jackson. Summary of the Amistad Slave Ship: The Amistad Slave Ship involved a rebellion of 53 Africans who had been abducted from Sierra Leone by Spanish slavers to be shipped as slaves to Cuba. The slaves seized control of the ship and ordered the navigator to sail for Africa but the Amistad was intercepted two months later off New York on 26 August 1839. The Amistad Case was later fought by John Quincy Adams and the 35 survivors of the rebellion were allowed to return to Sierra Leone in 1842. Summary of Samuel Morse and the First Telegraph: During the presidency of Martin Van Buren a new invention revolutionized communication in the US. Samuel Morse and the First Telegraph were developed and patented in the United States in 1837. Morse demonstrated his invention by sending telegraph messages between the Senate and House.